On January 21, California Governor Arnold Schwarzenegger announced the latest appointment to his cabinet, naming Biola alumnus Glen Thomas (’68) as secretary of education for California. Thomas is the first Biola graduate to have ever been appointed to the governor’s cabinet in California. Thomas considers his appointment a “calling” and says that he did not take the position for its honor or prestige. “I’m here to help improve student achievement, to assist struggling schools, to improve the support and training we give our teachers, and to help grow our great institutions of higher learning. 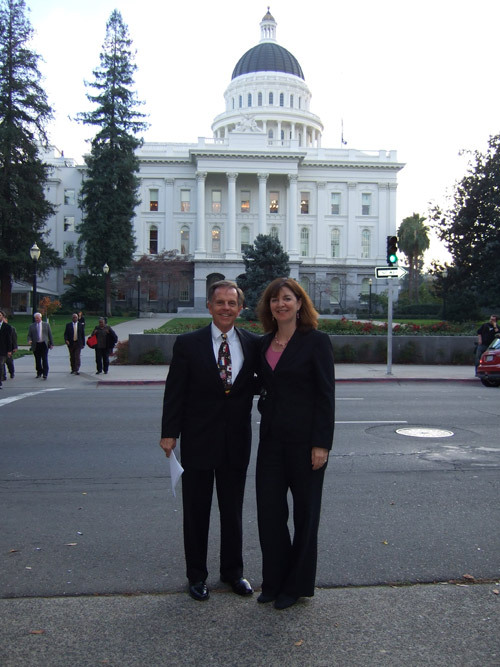 This mission is about our young people and the future of our state,” said Thomas, who has more than 30 years experience in education, most recently serving eight years as executive director of California’s County Superintendents Education Services Association. In his new job as cabinet secretary of education, Thomas, a 62-year-old Republican, will advise the governor on education issues, from pre-school through the university level. June Hetzel, dean of Biola’s newest school, School of Education, wasn’t surprised to hear that Thomas was appointed to the post. Having worked with him to develop Biola’s Emerging Leaders Institute—which annually sends Biola education graduates to the capital for a week of hands-on learning—Hetzel knows that Thomas is more than qualified for the job. Thomas has maintained close relations with Biola since graduating from the school in 1968. In addition to helping Hetzel found the Emerging Leaders Institute and participating in the program for the last six years, Thomas has also been a keynote speaker for the education alumni reunion during founder’s week, and for many years was a close friend and colleague of Biola’s seventh president Clyde Cook. “I loved my time at Biola University and my education there was excellent,” said Thomas, who added that the educational foundation he received at Biola was helpful when he went on to graduate school at Washington State (M.A.) and the University of Southern California (Ph.D). Biola Trustee Jerry Rueb (’69) and his wife Sue (’69) have been close friends with Glen and his wife Connie (’69) since they were all students at Biola together, and the four of them were together in the Rueb’s home a few days before Schwarzenegger’s announcement was made, praying that God would open the door for this appointment. Now that the announcement has been made, Jerry Rueb is excited for his friend and not at all surprised at his success. "Glen has always had the capacity to connect with people. His affable personality and dry wit disarm you and help you feel comfortable being yourself,” said Rueb, who thinks that Thomas is an ideal and timely choice for the position. “Few times in California history have the challenges to education been more complex, but I trust Glen to find some practical solutions that bring people together to impact the classrooms in our state." As he steps into this important new role, Thomas faces some great challenges, but also some exciting possibilities. He’s the Secretary of Education at a pivotal and uncertain time in California history, and is not about to let the opportunity go to waste. The New School of Education Launch: The Call to Educate the Next Generation event information. Written by Brett McCracken, Biola Magazine managing editor.